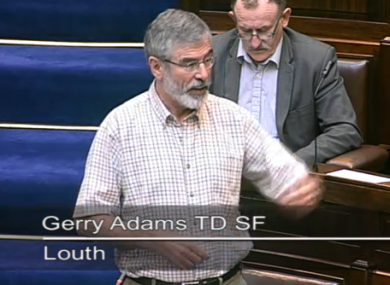 The Sinn Féin president has reiterated his denial in the face of questions in the Dáil today. SINN FÉIN PRESIDENT Gerry Adams has reiterated that he had no involvement in the abduction and killing of mother-of-ten Jean McConville in 1972 as the matter was raised again in the Dáil today. During questions to the Taoiseach Enda Kenny the matter was raised in the context of the Boston College tapes, a series of interviews with former IRA members some of which have this week been handed to the PSNI who are investigating McConville’s murder. Micheál Martin produced the Voices from the Grave book by journalist Ed Moloney and called on Adams to make a statement on the matter given that the book links him to McConville’s disappearance. Kenny said that people with information about the Belfast woman’s disappearance should come forward and said that people have “associated Gerry Adams with elements of that”. He went on to describe her killing as a “grave injustice” and said that efforts to recover the remains of The Disappeared need to continue. Boston College’s Belfast Project is a series of interviews with former republican and loyalist paramilitaries that were carried out as part of an oral history of The Troubles. One of the interviews is with Dolours Price, a former IRA member who died in January is said to have discussed McConville’s disappearance in her interview. Eleven of the tapes from the interviews have been given the PSNI officers investigating the case. Email “Gerry Adams: I played no part in the abduction and killing of Jean McConville”. Feedback on “Gerry Adams: I played no part in the abduction and killing of Jean McConville”.